As a parent, I often try to envision the world as my children see it or to approach a new situation as they might. They are always so inquisitive and eager to understand how things work and why we do something a specific way. They readily use their imaginations to turn the ordinary into something extraordinary. Children have the unique opportunity to shape not only their ambitions but also the ability to impact the future of the people and places around them. I imagine a place where all children in our community and surrounding communities will be challenged to solve problems, explore new ideas, create something, believe in themselves, and explore everything that makes our region truly unique. The Children’s Museum of Oswego has successfully operated as a “Museum Without Walls,” since 2013, bringing highly engaging exhibits and programs to Oswego County schools, libraries and community events. It’s time for us to reach higher! In February, we moved into our downtown location at 7 West Bridge Street. We moved in all of our mobile exhibits as we planned for our permanent exhibits. We have already welcomed many children and families through our doors as well as field trips from over 20 schools in just three months. We are eager to begin sharing our vision for the future of the museum with the community and our growing network of supporters. This is no longer just a dream, we’re ready to take the next step. We will build a one-of-a-kind learning space that brings together our children, families and community for interactions that develop essential skills, inspire creativity, nurture discovery and promote lifelong learning. We already have growing attendance at the museum, a dynamic location, wonderful volunteers, a committed board and well-developed plans. All we need now is YOUR SUPPORT. Let your imagination run wild and join us to make this dream become a reality! Our vision is to significantly enhance the quality of life and educational opportunities for families in Oswego and the surrounding area, thereby strengthening our community. Our mission is to inspire children to learn, discover, create and explore through the power of play! 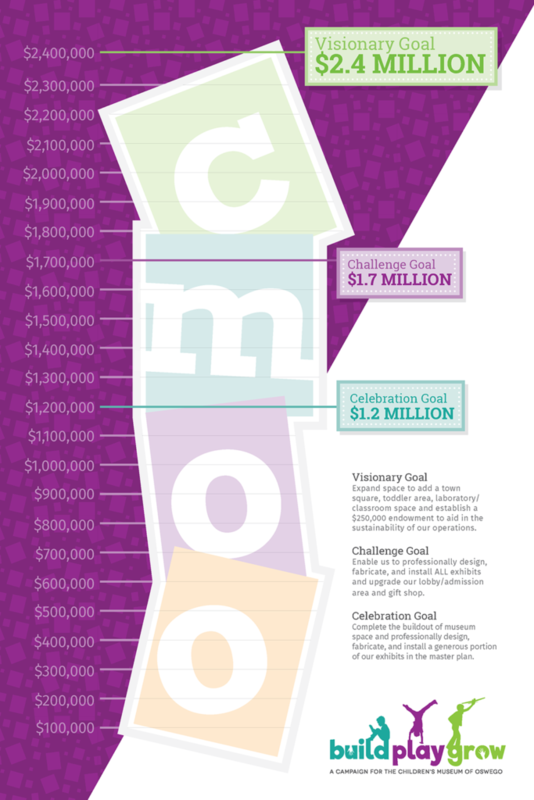 Our campaign to raise $2.4million dollars is well under way. Read all of the details in our Case Statement (PDF).